We all have heard how much better organic food is for us, how leaving the chemicals and artificial coloring, along with genetic modification can benefit us all, but did you know that you can actually have organic candy too? 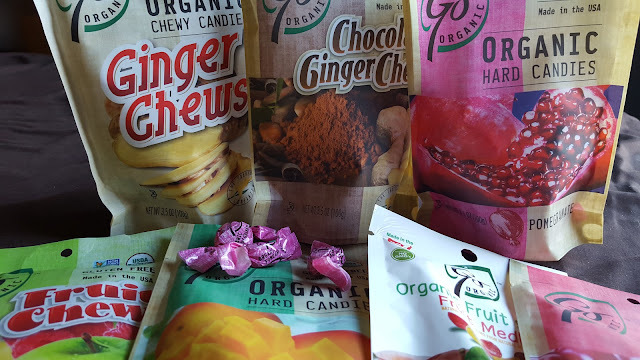 GoOrganic Organic candies offer up an organic alternative. According to the United States Department of Agriculture (USDA), Organic means food with no artificial fertilizers, genetic modification, irradiation or conventional pesticides. Who wants any of that in their candy anyhow? My favorite thing about GoOrganic candies is the wide range of offerings. We were sent their line of candy to try out and let you all know how they went over with our family. I will say, many of the candies include ginger- and my children were not a fan. I, however, do enjoy ginger. I especially liked the Chocolate Ginger Chews. The kids favorite were the fruit chew candies and fruit snacks ( and I loved these as well...). The hard candies were not anyone's favorite in particular, but they weren't bad. The cherry candy did remind me a lot of cough drops, though. Ingredients include organic evaporated cane juice and organic brown rice syrup for sweetness. This is CLEAN candy, containing no trans fats, no preservatives, no corn syrup, no FD&C colors and no hydrogenated oils. The line has a 2 year shelf life, is gluten free and Kosher. Adults and kids can feel good about having GoOrganic as a wholesome treat. I think these candies are a good option for those who are looking for a sweet treat without giving up their commitment to choosing organic goods.